Navigating the famed New York Public Library that's located in the Stephen A. Schwarzman Building can be intimidating even to long-time members. The Manhattan institution houses millions of volumes, many of which are stored in the stacks deep below the neighboring Bryant Park. In an effort to make these materials more accessible to readers, the branch has installed a little book-mobile that zips through the building, Quartz reports. 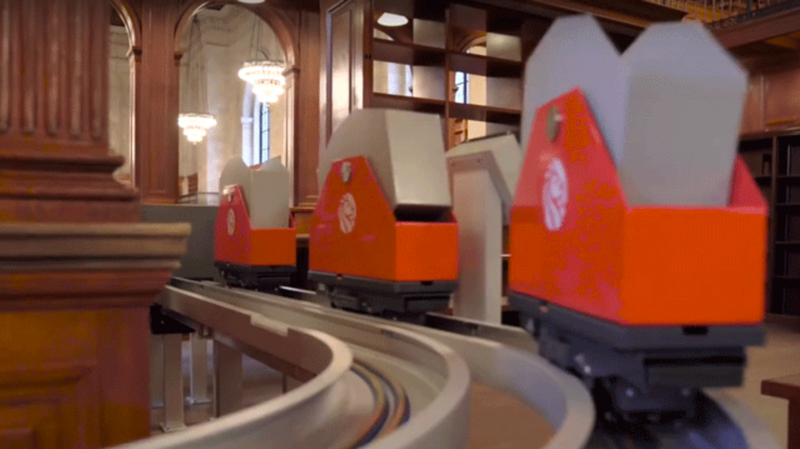 The mini transportation system—which the library describes as a “state-of-the-art book train,” according to Gothamist—begins in the storage rooms beneath the park and snakes up to the Rose Main Reading Room on the third floor. Each of the 24 carts carry up to 30 pounds of literature at a time, zooming in and out of tunnels and climbing 90-degree inclines along the journey. The book train is part of a larger overall renovation to the Rose Room that’s been two years in the making. Visitors can experience the fancy new book delivery system for themselves when the space reopens on October 5.